Come and See Our New Kitchen! Our kitchen has been renovated and is ready to serve you. Come visit and see what’s cooking!! 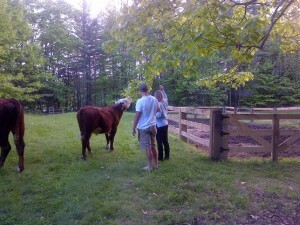 Our new additions, Bullwinkle and Rusty, hereford steers have taken up residence in our pasture next to the Inn. They are very friendly and bounce around like puppies when it’s time for their afternoon snack of sweet grain.